Chugoku Jozo was started in 1918 as a distributor of Sake and related traditional Japanese liquors. They specialized in all the stuff that happens after distillation, meaning that they purchased raw, young spirit form distillers and then mixed, aged, bottled, and distributed it for themselves. They followed this same formula when the branched out into other spirits as well. When Chungoku Jozu decided to add Whisky to their lineup, they started like they always had … by buying from producers who were already making it. And their timing was great. Since America was still reeling from Prohibition and there was a collapse of the Whisky industry around to world, those distilleries were perfectly happy to sell young, unaged Whisky in bulk to the crazy Japanese guys. So, they bought single-malt Whisky from Scotland and fine grain Whisky from Canada and shipped it all back to Japan. The team at Chungoku Jozu knew what they were doing. They put those oak Sherry casks deep within an abandoned train tunnel and let it sit. So, what we have here is a NAS Whisky that is about 60% Canadian, 40% Scottish, and aged about 8 years in Spanish Sherry casks under ground in Japan. So … what the heck do you call this United Nations of Whisky? Jap-Can-Span-Scotch? Scot-Pan-Span-Ese? Ultimately it doesn’t matter since you will just call it delicious. 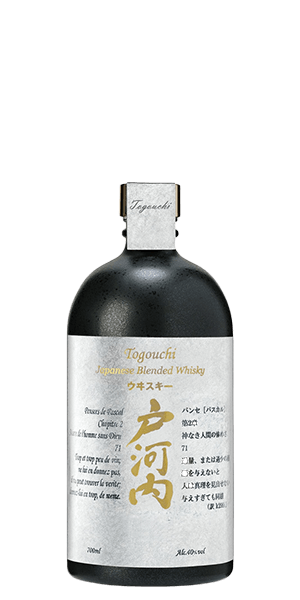 What does Togouchi Blended Japanese Whisky taste like? The Flavor Spiral™ shows the most common flavors that you'll taste in Togouchi Blended Japanese Whisky and gives you a chance to have a taste of it before actually tasting it. Sweet at first, then opening up to a blast of oak and dark chocolate. Refined finish with a mouthful of oak and sugar. Oak, spicy notes, peaty, fragrant, floral, biscuit, sherry, grain, sweet. A smooth, light and a bit sweet sipping whiskey. Very good, for its price point, as a daily sipper. Extremely light and smooth, easy to drink. Solid for a "daily drinker". It is an outstanding, creamy, blended Japanese Whisky with a delicate finish. Until reading these reviews I thought there was a mix up and we got tequila. Smooth. Almost sweet. Very nice. Sweet and drinkable. Very Canadian.